Out of public view in Budapest’s Istvántelek railway works is an extraordinary collection of historic steam locomotives and rolling stock. Ben Jones was given a rare opportunity to visit the depot for The RM. IMAGINE for a moment Stratford Works, in east London, had not been demolished and redeveloped. Instead, it remained open as a works and depot serving the modern railway of the capital, maintaining 1970s electric locomotives and modern EMUs side-by-side. 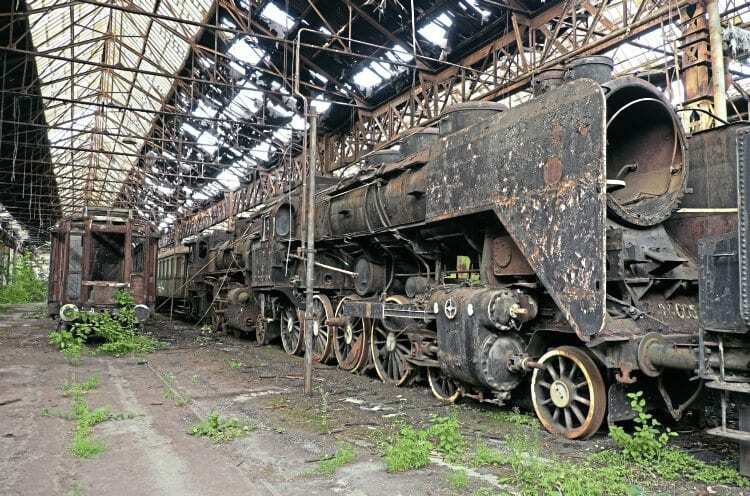 Now imagine the reaction of British enthusiasts if, deep within that works, out of public reach, there were dozens of unrestored steam locomotives and historic items of rolling stock. It’s difficult to believe such a remarkable place could exist in the UK in 2017, or indeed anywhere else in the world, but exist it does, and it’s just a two-hour flight from London. For decades, important artefacts ranging from an 1882-built double-frame Austro-Hungarian 0-6-0 to powerful postwar 4-8-0s and a fin de siècle Wagon-Lits ‘Orient Express’ saloon car, have waited silently inside an increasingly decrepit 19th century building at Budapest’s Istvántelek Works. Even more remarkably, these forgotten survivors sit just a few metres from one of Hungarian Railways’ (MÁV’s) most up-to-date depots, maintaining modern Swiss-designed ‘FLIRT’ EMUs. However, the increasingly dangerous state of the building, with crumbling brickwork and falling glass roof panels, means safe access to the vehicles is increasingly difficult, and out of bounds to all but a few visitors. Read more in the December issue of The RM – on sale now!